Family-owned businesses in Delta are invited to attend a complimentary financial investment seminar on Tuesday, June 19 from 6:00pm-8:00pm at the Coast Tsawwassen Inn, 1665 56th Street, Delta. 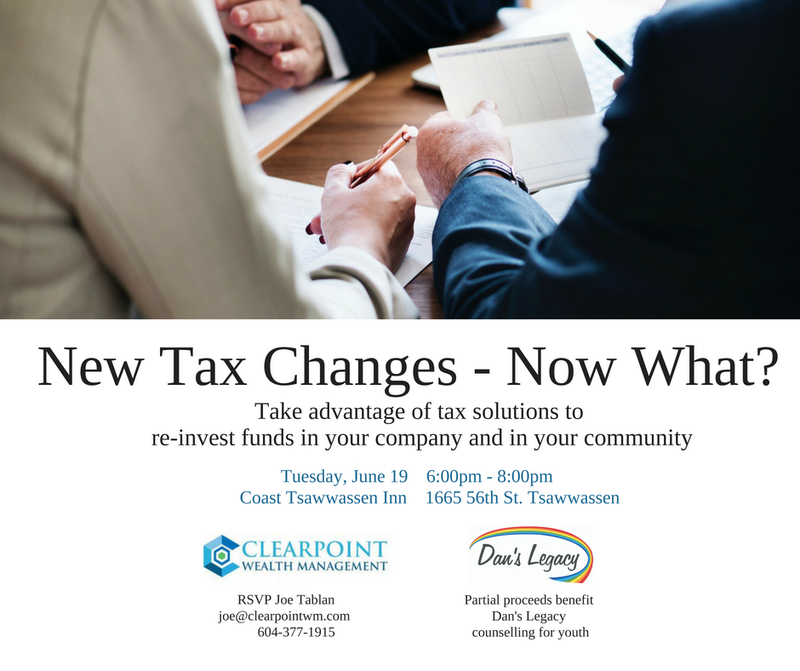 Joe Tablan, President of Clearpoint Wealth Management (CWM), will explain how business owners can take advantage of tax solutions to re-invest funds in their companies and have a positive impact in the community. The seminar is also a fundraiser for the Dan’s Legacy Foundation which provides counselling and life-skills intervention programs for youth dealing with trauma-based mental health and addictions issues. For each new client signed up at the seminar, CWM will donate 10% to Dan’s Legacy. Please RSVP Joe Tablan at joe@clearpointwm.com or call 604- 377-1915. Invite a friend or colleague!